Jade Mountain is a luxurious resort in St Lucia with striking architecture, occupying an incredible spot with breathtaking views over the Caribbean Sea and the Pitons. It is no surprise that the property regularly features in Conde Nast and other inspirational travel publications, having been designed by its architect and owner, Nick Troubetzkoy. The hotel was named ‘St Lucia’s Leading Hotel’ at the 2017 World Travel Awards. Jade Mountain is a peaceful sanctuary which offers a unique holiday experience, set on a hillside on the west coast of St Lucia above its sister resort, the renowned Anse Chastanet. All accommodation at Jade Mountain offers exclusive luxury, with 29 sanctuaries that all have 15-foot high ceilings and are missing a fourth wall to create an open-ended view of the spectacular Piton mountains. The majority of these sanctuaries also have a private, heated infinity pool that may vary in size depending on your chosen category. There are a further five Jacuzzi suites featuring a large tub which is perfect for two people. All rooms are reached by their own private bridge, adding to the feeling of privacy and seclusion. Service at Jade Mountain is exceptional, with butlers on call 24 hours per day and staff who are happy to make arrangements for anything you may require - guests can enjoy spa treatments, evening drinks and even yoga classes, all within your sanctuary. The resort promises excellent dining options, primarily at The Jade Mountain Club which is set around the resort’s infinity pool and serves breakfast, lunch and dinner. With an emphasis on local produce and Caribbean fusion cuisine, guests are offered an exciting and varied menu which is the inspiration of Chef Allen Susser. For a perfect spot to enjoy drinks and canapés, guests can choose the Celestial Terrace which is set above the resort with, if possible, even more incredible views. Private dinners in your sanctuary can be easily arranged and allow guests to select from a superb range of menus crafted by the culinary team at Jade Mountain. Facilities at Jade Mountain including a spa, a fitness studio and a boutique. Additionally, guests may wander down the hillside or jump on a shuttle bus to use the facilities of Anse Chastanet, giving access to two beaches, a range of watersports, sunset sails, bike trails and a further six restaurants. 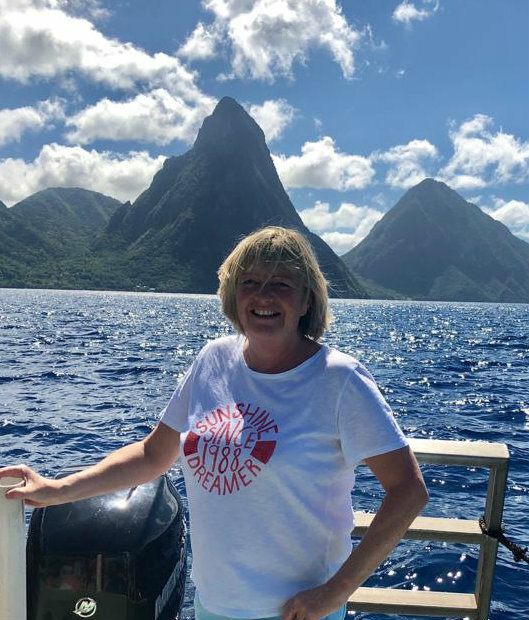 For more information about Jade Mountain or alternative resorts, take a look at Su's St Lucia Trip Diary. Jade Mountain is truly breathtaking, one of the most amazing resorts I have ever visited. Stepping into your private sanctuary and enjoying the view of the Pitons and across the bay is a memorable experience for anyone. If you are travelling to celebrate something special I would definitely recommend pushing the boat out for at least part of your trip and upgrading to a suite with a private infinity pool - a spectactular setting for an early evening dip! Dining at the Jade Mountain Club is a real treat, and for a hands-on experience guests can visit the chocolate lab to make their own tasty treats - great fun and delicious. For an amazing once in a lifetime experience I can't recommend Jade Mountain highly enough - treat yourself!